The inescapable reality of life is that everyone ages. Parts of the body that people never really thought about when they were young, scream for attention as they get older. One such area is the spine. Degenerative disc disease is a very real reality for people today. Science Daily reports that by age 40, one-third of all people have “image-based evidence of moderate to severe degenerative disc disease.” What is this and what can you do about it? 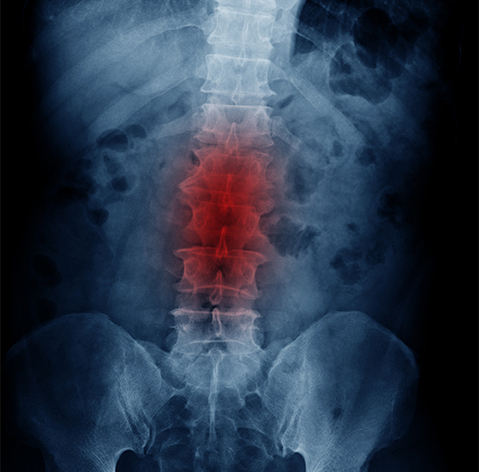 Separating each vertebra in the spine are discs filled with fluid that act as shock absorbers for the spine. When the spine flexes and moves, these discs compress and expand, keeping the vertebrae from rubbing against each other and pinching nerves. As the body ages, so do these discs, slowly loosing their filling and flexibility. This disc loss can cause tiny motions within the spine that are not normal, affecting the muscles and nerves surrounding the spine and creating pain. The disc fluid is inflammatory and may be another source of discomfort as it leaks out of the discs and into the surrounding tissues. The cause of degenerative disc disease is really unknown, according to John Hopkins Medical. Doctors understand that as people age, so do the discs. They lose their “jelly-like” filling and compress. The Arthritis Foundation also shares that traumatic injuries that cause swelling and soreness may also contribute to degenerative disc disease. Everyday activities and sports can also add to the wear and tear on the discs. Does that mean that in order to avoid degenerative disc disease you have to stop playing sports and moving around? If that were the case, you would have to stop living. Prevention is worth a pound of cure, so taking measures to keep your spine as healthy as possible will keep you from experiencing the pain and discomfort associated with degenerative disc disease. Maintain a healthy weight. Summit Orthopedics reports that carrying excessive weight increases the problems of degenerative disc disease. The added weight compresses the spine more than your ideal weight, moving up the timeline on damaging the discs. Fat cells are also “pro-inflammatory” and keeps people from responding as well to pain treatments as those who are at their ideal weight. Maintaining your ideal weight should be viewed as a long-term solution. Stop smoking. The dangers of smoking have been promulgated for years, but Dr. Timothy Kuklo from St. Luke’s Medical Center clearly delineates how smoking affects degenerative disc disease. The smoking increases back pain levels and the amount of disc degeneration that takes place. It also decreases the effectiveness of any medications, making degenerative disc disease harder to treat. If someone who smokes should end up needing surgery, smoking significantly slows the healing process. Exercise. If exercise and sports increase the loss of fluid, why should you exercise? Harvard Medical School shares that individuals who stay active and exercise experience less pain than those who become immobile when pain hits. Becoming sedentary because of pain decreases your flexibility and muscle tone, making your spine more prone to slipping. Pick exercises that strengthen your core muscles so your spine is well supported. Be willing to adapt your exercise as you age so that it is appropriate. Eat healthy and drink plenty of fluids. According to a report from the BBC, a study by Barcelona’s Institute of Bioengineering shows that nutrition directly affects the discs and their health. Eating a well-balanced diet and drinking plenty of fluids will help maintain a healthy body and a healthy spine. Degenerative disc disease may not be something that is completely avoidable, but you can put up a valiant fight against it. If you are already suffering from severe neck or back pain, call the specialists at Atlanta Brain and Spine Care. They can diagnose what is the source of the problem and get you up and running again.